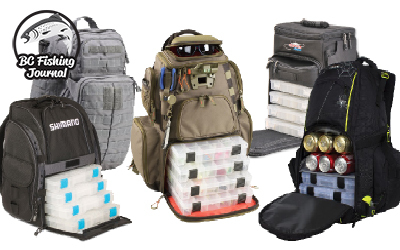 Do you know what kind of tackle box or bag you should be using? Hard, soft, rolling bag, there are a number of options to manage protect and manage your tackle. This article outlines the pros/cons of the various types of fishing storage out there and what to think about when buying a tackle box or bag. I have included the fishing bags and boxes that I recommend based on your style of fishing and gear. 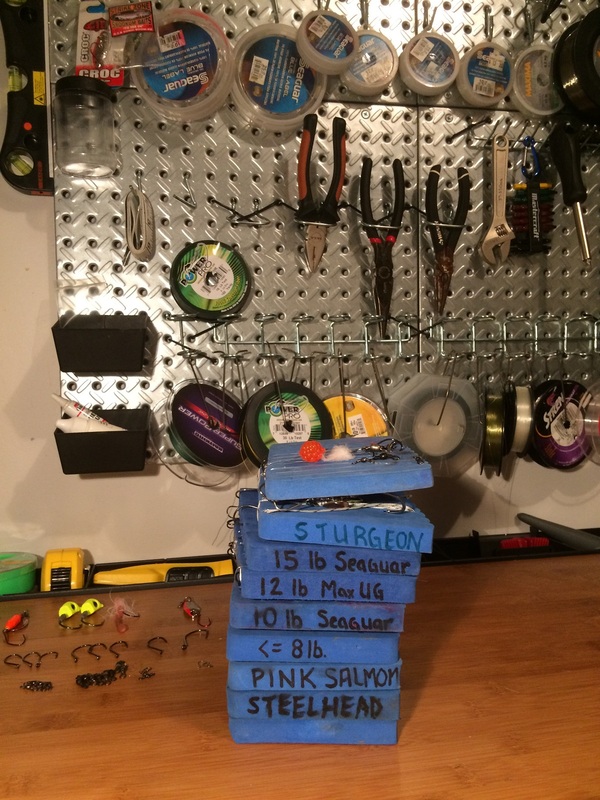 Lastly, at the bottom of the page, I’ve included my own personal tips on how I organize my own tackle! There are many types tackle boxes available and finding the right one can be a time-consuming adventure. 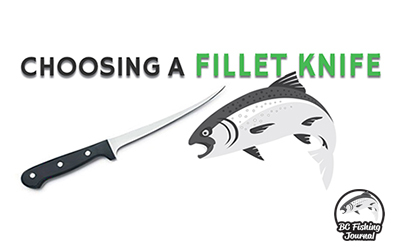 To make the process easier, you need to first assess your fishing needs and style. For example, if you are a bank fisherman and don’t change spots frequently, then a larger standard tackle box will keep everything you need at your fingertips, and you will not have to carry it much. If you are mobile when you fish, then tackle box weight, size, and portability are very important. Here, a lighter tackle bag may best fit your needs. When boat fishing, tackle box weight isn’t as much of an issue, but you will want the box to float if something knocks it into the water. Some tackle bags and boxes can float. Overall, if you have a good idea of your needs, you will find a great tackle box among the large number of products available. The KastKing family of tackle bags are designed with function and efficiency in mind. Constructed of water repellent 420D Ripstop Nylon, the largest bag has the ability to carry up to 12 3700 and five 3600 utility tackle boxes. These bags have up to 17 organization pockets and easy-access areas that hold commonly-used tools such as pliers. Most bags come with a neo-grip shoulder strap that won’t slip and padded handles that make hand carrying comfortable. The zippers are made of self-healing material that is designed for frequent use. Some models contain adjustable dividers, enabling you to section off the large number of trays each bag holds. The mesh pockets hold your gear and keep the contents dry. These bags can be used for purposes outside of fishing, including travel, hunting, camping, and sports. Although these bags are beautiful and smartly-designed, there is some room for improvement. They do not come with any utility tackle boxes, tools, or other gear. You will have to purchase these items separately. Although the nylon bag material is coated with water repellent, the jury is still out on how long the repellent will last. This tackle bag is a one-of-a-kind product that aims to meet all needs in one unit. It is constructed of heavy duty fabric that is water resistant. It holds the included eight large utility tackle boxes in a stacked arrangement. One of the biggest strengths of this bag is the front organizer. It includes an organizer pocket with zipper enclosure and several exterior tool holders and accessory loops that make tool searching a snap. The adjustable shoulder strap and padded handle help you stay comfortable as you hike to your favorite fishing spots. As with all fishing bags, it could use a few improvements. It doesn’t have a fully-waterproof bottom. If it rests on wet ground, it could pick up some moisture. Although the main compartment holds up to eight utility boxes, you will have to stack them on top of each other. If you place them on their side for easier access, then you likely will not have enough room for eight boxes. This stylish tackle bag boasts a smart design and durable features that will provide seasons of busy use. It comes with four large utility tackle boxes that are stored on their sides for easier access. It is constructed of long-lasting 1680 denier polyester with a PVC backing. The two front pockets have organizers and holders for tools such as pliers, and the remainder of the bag has additional pockets. The base of the unit has a waterproof and skid-resistant base to keep it dry and reduce sagging. Although this bag has a plenty of features (and a really cool logo), one of its drawbacks is the size of the main compartment. It likely won’t fit all your utility boxes, so you will have to do some extra planning and take ones that you will use the most. 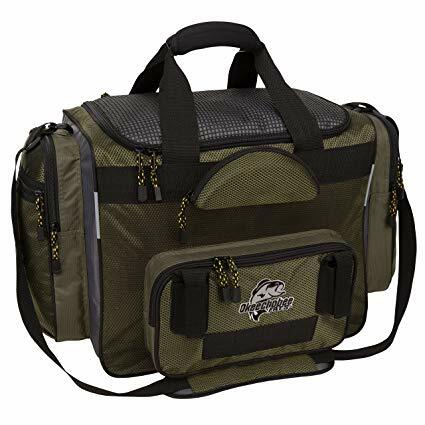 This bag is a good option if you prefer something smaller and don’t mind switching out utility boxes based on your day’s fishing needs. Elkton has designed one of the most versatile tackle boxes on the market. First, it’s easy on your back. 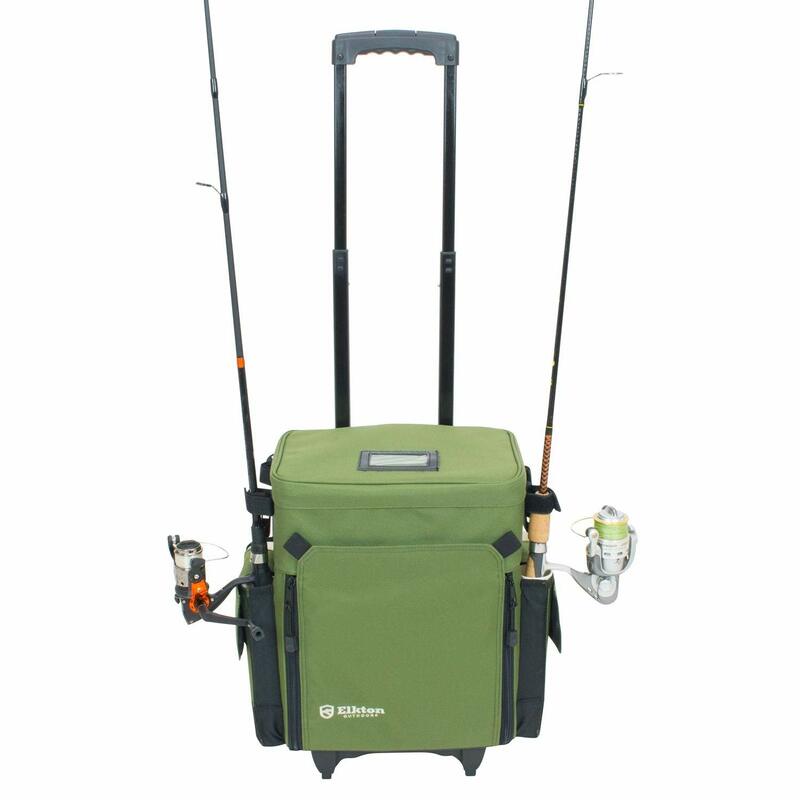 It is equipped with an extendable handle with four rollers on the bottom so you can just pull it to your favorite fishing hole. If you are walking on a rocky or sandy area, just retract the handle and use the comfortable shoulder strap. It contains an adjustable to storage compartment, and the main compartment holds up to five 3600 size utility tackle boxes. The PVC-constructed holders fit up to four fishing rods so you no longer have to worry about tangled lines when you carry them all with one hand. The Elkton is waterproof, whereas many competitors are merely water resistant. This box checks many boxes in the list of a fisherman’s needs, but it may not be for everyone. It weighs in at 11.8 pounds, which is almost nine pounds heavier than some of the largest fishing bags. If your fishing style involves bank fishing with frequent spot changes, it could become physically challenging if you can’t roll it. If you need a tackle bag that will survive challenging outdoor conditions, then you should consider this product. It is made with highly-dense 1000D nylon fabric that is water resistant. The zippers are double-stitched and heavy duty, and the military-grade elastic ropes and shoulder strap will hold big loads. It also has a detachable mini box with handle so you can venture to many spots with the lightest load possible. 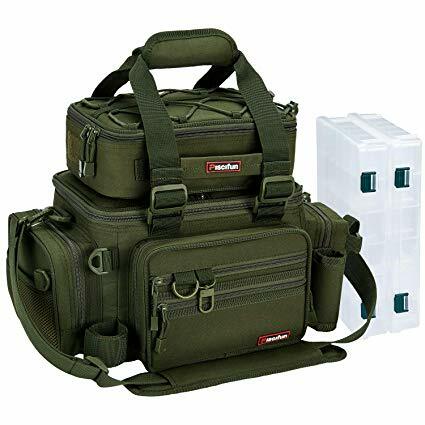 The main compartment holds three 3600 utility boxes flanked by a fishing reel storage compartment and numerous other pockets. 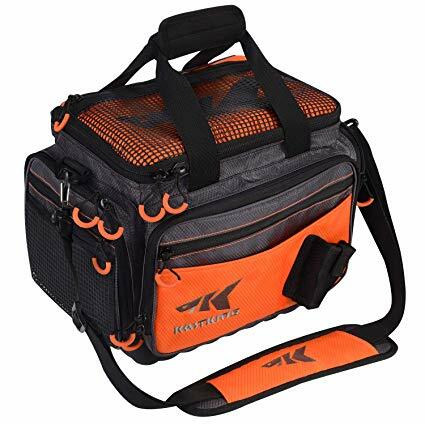 With so much versatility and tough construction, you can use this bag for many other functions, including camping, hunting, hiking, traveling, and more. 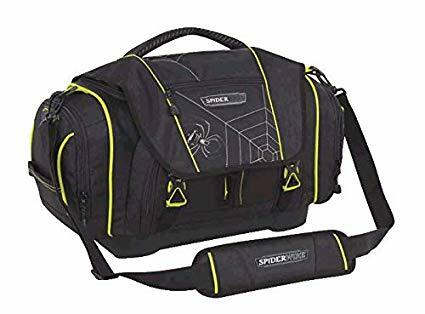 It is difficult to find many faults with this bag, but with so many features it measures out at over 16” long, and that can be a bit bulky for some people. It is also unknown if the bottom of the bag is fully waterproof, so you may have to dry it out after placing the bag on a wet surface. These boxes are best for anglers who need plenty of storage room and want easy access to all their equipment. They are typically constructed of durable plastic and come in many sizes. Special compartments make organizing gear easy and many use removable dividers that adapt to the size of the lures or accessories stored. Many standard tackle boxes have fold out trays that make all your tackle viewable at once, while others have drawers that pull outward. Some have clear top sections so you can store jars and other types of baits that require frequent accessibility. Although they are popular and useful, standard tackle boxes have drawbacks. Carrying a heavy tackle box, chair, net, fishing poles, and bait in one trip can be a challenge. And if you don’t keep your big tackle box neat and organized, your smallest tackle will find hiding places and cost you more money in the long run. If you are a heavy bank fisherman and walk to many spots during a single trip, then you will find a tackle bag more useful. Tackle bags offer lighter weight and accessible pockets, and many bags are designed to be wearable while you fish. All good tackle bags include shoulder straps, and some even have straps that will attach the bag to your waist. Traits of some of the best tackle bags include high water repellency, detachable pieces, external holders for tools such as pliers, and easy access to the internal utility boxes. Since tackle bags include many pockets and other compartments separate from the main compartment, it may take time to remember where you have certain pieces stored. You will need to open a compartment of the bag and then open a utility boxes to find a piece of tackle, but this is one of the trade-offs when owning a lighter bag versus a heavier standard tackle box. To save weight, most tackle bags will not store all the fishing accessories you own, but it is simple to switch out storage boxes within your bag before each trip. Whether you use a standard tackle box or tackle bag, you will save time by keeping your lures and accessories organized. Sorting your lures and grouping them together by fish species will quickly give you an inventory of what you have available. 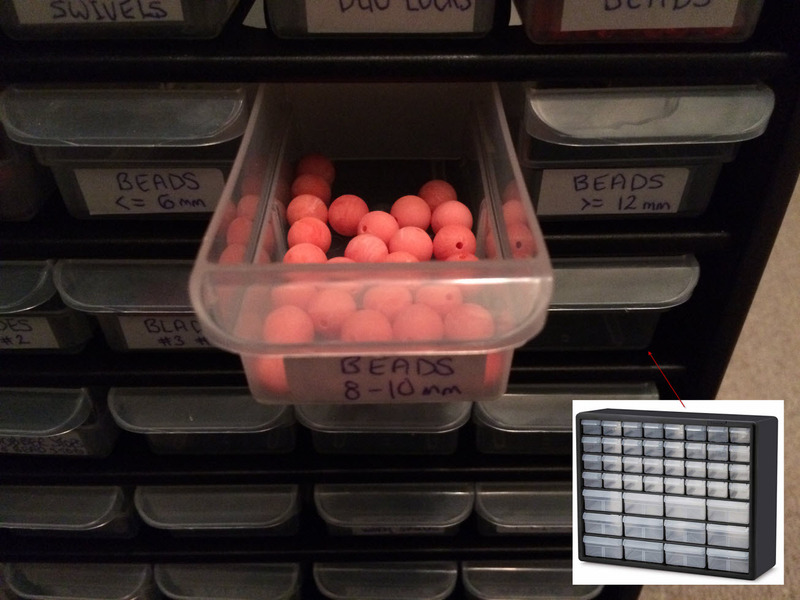 You can use tray dividers to adjust the size of compartments for smaller lures. If your bag or box has small compartments that close, then those are great locations for items such as hooks, swivels, and weights. Many fisherman use soft plastic baits and keep large amounts of them. Mixing plastic baits of different colors may cause the colors to run and make it difficult to locate what you need. Keep each type and color in the same compartment or bag, and you’ll keep your plastics healthy and organized. 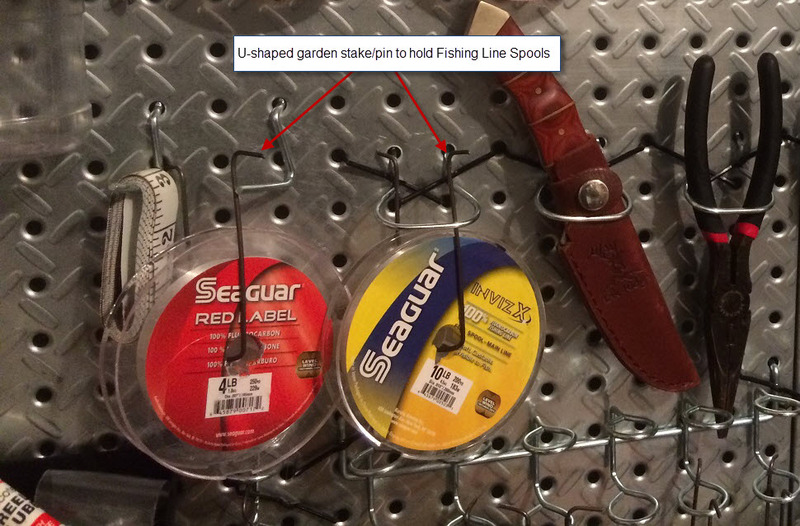 Below are some of my favorite ways to store my terminal tackle, line spools and leader line. 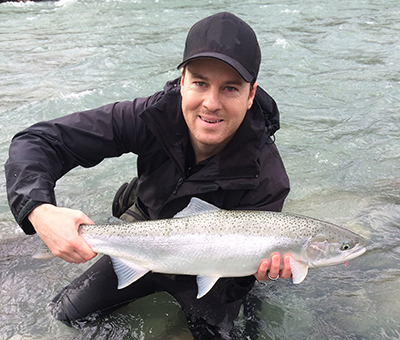 If you want more fishing gear organizational tips check out the Tips page. One way I like to organize my fishing line spools is to use u-shaped garden spikes/pins. These spikes are cheap and can be picked up at any Home Depot or on Amazon here. Depending on how you’re hanging or organizing the spools, you’ll likely need to bend the ends out like I have in the photo below. To bend the ends outward, use 2 sets of pliers one to hold the arm and the other to bend the end out (usually an inch or two from the end). I love to have a backup of all my terminal tackle, things like hooks, swivels, beads, clips, weights, jig heads, duo-locks, … you get the idea. One great way to store these types of things is using a craft cabinet or if you want something a little sturdier a screws/nails cabinet. These cabinets are essentially hard plastic mini-bins where you can compartmentalize each of your terminal tackle items. I like the clear plastic trays as you can see what’s inside each of them and I also like to use small white labels I pick up from Walmart to mark down what’s inside. The photo below is a close up of one of my storage cabinets. Leader boards or rollers are cheap and I recommend buying a handful of them and sorting them out by leader line weight (#) and/or by species. These are fantastic ways to organize your pre-tied leaders. 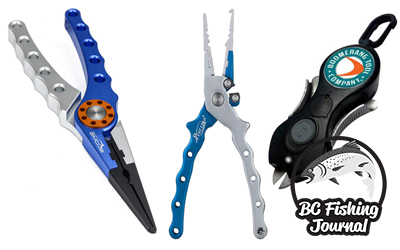 These are easily kept in your fishing bag or tackle boxes and make for quick change ups when your on the water. I like to keep my leader lines to a specific line # so I’m not making a mistake and using a weaker or stronger leader line than I intend to. I differentiate by taking a Sharpie marker and writing the leader line directly on the boards (see photo below). For me, I have both a hard and soft bags and boxes for storing my fishing gear. I have the big Plano plastic box for all my tackle that stays at home. These are helpful for storing seasonal tackle that you’re not often using. My favorite bag that I’m continually using and taking to the water is the KastKing bag. It has more than enough room for your plastic tackle trays as well as all the other extras you need for a fishing trip. This bag holds all my general tools, licences, lines, etc, so I don’t have to prepare a bag each time I get out. The only thing I prepare is switching out lures in the plastic trays and then I grab the bag and I’m gone. It’s a handy and time saving bag to have for these types of uses.